A couple of GPS anomalies struck yesterday (January 26, 2016), one systemic and the other delaying launch of the final Block IIF satellite. At 2:49 a.m. EST, the 2nd Space Operations Squadron (2SOPS) at the 50th Space Wing, Schriever Air Force Base, Colorado, verified that users were experiencing GPS timing issues.Further investigation revealed an issue in the GPS ground software that affected the time on legacy L-band signals. This glitch appeared when the oldest GPS satellite, space vehicle number (SVN) 23, was removed from the constellation. SVN 23 was the last operational GPS Block IIA satellite in the constellation. The problem apparently stemmed from an erroneous software upload as SVN 23 was taken offline. 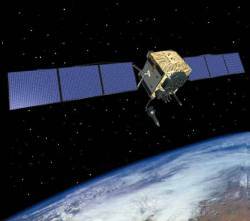 Fifteen operational GPS satellites reportedly were affected by the flaw. Although the core navigation systems were operating normally, the coordinated universal time (UTC) timing signal was off by 13 microseconds, which exceeded the design specifications and affected some timing user equipment. The issue was resolved at 8:10 a.m. EST, according to Maj. Roland Rainey Jr., 2SOPS director of operations; however, global users may have experienced GPS timing issues for several hours. Meanwhile, the launch of a United Launch Alliance Atlas V rocket carrying the GPS IIF-12 mission has been delayed to no earlier than February 4 to allow time for an evaluation of concerns over the integrity of electrical connectors on the Atlas V booster. Mating of the GPS IIF-12 spacecraft to the Atlas V launch vehicle has been delayed pending assessment. The mission is set to liftoff off from Space Launch Complex 41 at Cape Canaveral Air Force Station in Florida. GPS IIF-12 (SVN-70/PRN-32) will be placed in the F1 slot now occupied by SVN-41/PRN-14, which will be re-phased to a newly defined F7 node once SVN-70 is set healthy. A U.S. Strategic Command’s Commercial Integration Cell, operating out of the Joint Space Operations Center, served as the portal to determine the scope of commercial user impacts from the UTC timing glitch. Additionally, the Joint Space Operations Center (JSOC) at Vandenberg Air Force Base, California, has not received any reports of issues with GPS-aided munitions. JSOC said that the timing error is not attributable to any type of outside interference such as jamming or spoofing. Commercial and civil users who experienced effects that they believe were related to the UTC timing anomaly can contact the U.S. Coast Guard Navigation Center at (703) 313-5900. Reference Systems, UTC Leap Second, and L2C Receivers?